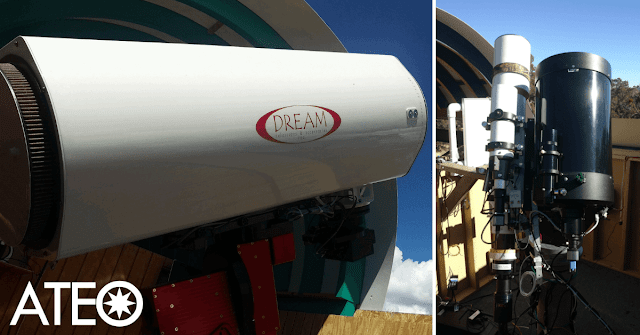 Astronomical Telescopes for Educational Outreach ATEO-1 (Left) and ATEO-2A and B (Right). The fee for a Public Image Request is a donation in the amount of your choice via PayPal or Credit Card. All proceeds are applied to the continuing efforts of funding the remote telescope's hosting and maintenance costs at their dark site located at an elevation of 7,778 ft. in New Mexico. Once your image request is submitted, the request will then be inserted into the ATEO remote telescope's network queue. When the image has been processed and uploaded, an email will be sent to you with instructions on how to retrieve your image. You can find more information on using the PIR by visiting its FAQ page. 16" f3.7 (ATEO-1) Astrograph Remote Imaging Telescope. If you are interested in becoming an active user with the ATEO Remote Robotic Telescope Network via our ATEO Portal, please refer to our post with our instructional videos on how to register for a new user account thru using the telescope console. **Attention Educators: If you are interested in imaging with the Astronomical Telescopes for Educational Outreach for your classroom using our Educational Image Request (EIR) form, please Contact Us.